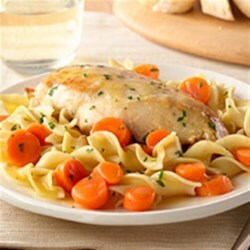 "Browned chicken breasts and carrots are simmered in broth, tossed with hot cooked egg noodles and grated Parmesan cheese for a weeknight meal that's ready in 20 minutes." Add Recipe Ready Cuts Sliced Carrots and chicken broth. Bring to a boil over high heat. Reduce heat to low and simmer covered 5 minutes. Toss hot cooked noodles in serving bowl with remaining butter and parmesan cheese. Top with chicken and carrots and sprinkle, if desired, with parsley. I love this easy recipe. Perfect for a college student or beginning cook!! I cut up the chicken into bite size pieces and mixed it all together. I also added a little thyme and cayenne pepper. This was a really good recipe! The only changes I made were that I cubed the chicken instead of having whole breasts and added mashed potatoes, which was a great addition. I really liked the simplicity of this recipe. However, I salt and peppered the chicken and added garlic. The seasoning helped build more flavor. It was okay but it needed more herbs. I will try to add more next time, for it won't taste plain. My advice is to play with this recipes.